Welcome to Stamp Magazine's blog, updated by Adrian Keppel every Friday. The other day, when a forum thread was started inviting people to set up a round robin swap, I was quick to state that I'd given up swaps altogether. But the truth, as always, is just a bit more diffuse. Yes, I used to swap a lot when I still collected used stamps as well, and yes, I've stopped swapping ever since I stopped collecting used stamps. But I kept in touch with my favourite swapper Paulo from Portugal (oi lá, como você está?) and I still swap with him, if only mint stamps now. I recently received his latest sending, a big envelope packed full with goodies. 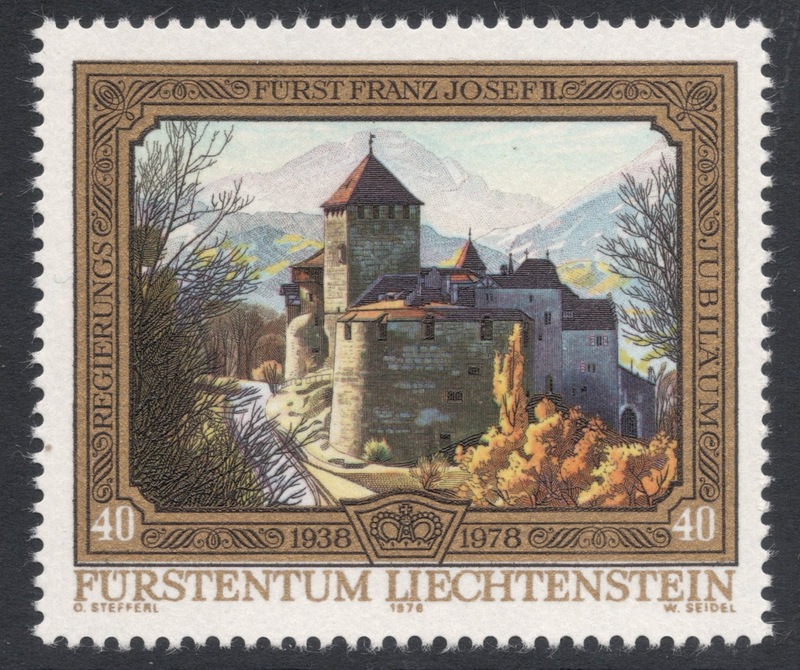 Among that lot were a couple of year sets from Liechtenstein. Fairly recent stuff, say from the early 1970s onwards. Not immediately what I'd go out and look for. But, as so often, there were many hidden gems among them, so I'm glad to now be able to show some to you! First of all I could add to my collection of omnibus Europa issues. I absolutely love these because they're proper omnibus sets based on common designs, yet each country adds their own little twist. I like these 1972 and 1973 stamps shown here, because they're so much more brightly coloured than many of the others and because the one on the left is quite a different take on the common design. On many other stamps the design is placed in a large one-coloured field. Most of the gems, however, are to be found among the many recess-printed stamp issues. 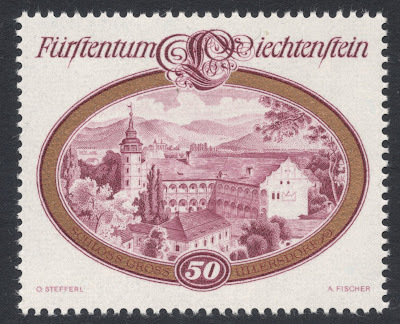 In 1977, a set of four stamps was issued depicting castles. 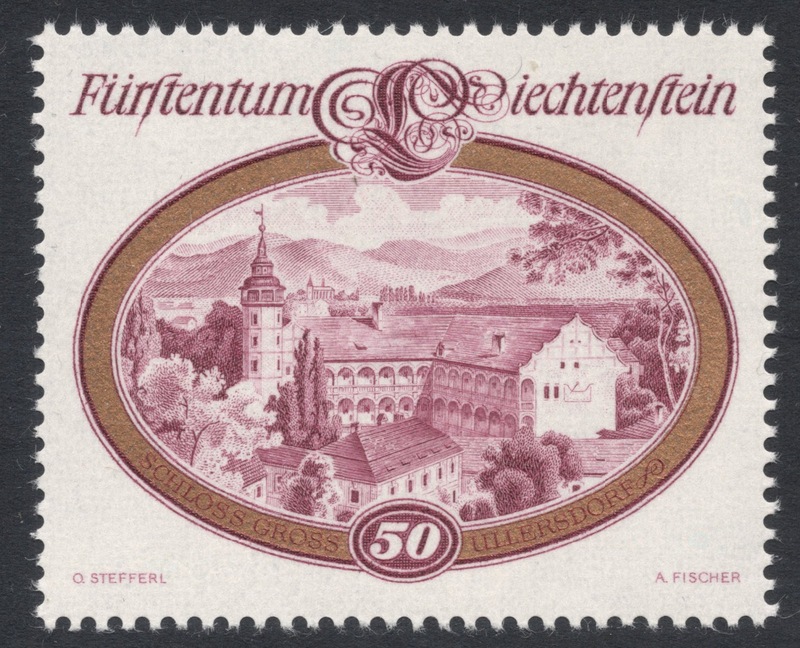 The 50r shows Ullersdorf Castle in Moravia. The very fine engraving is by Fischer. 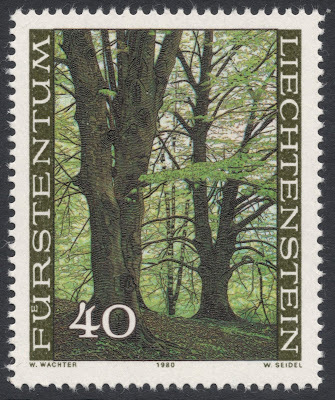 The above is very much a traditional stamp, but many of the country's engraved stamps are printed in combination of recess and photo, such as this 1978 stamp marking the 40th anniversary of Prince Francis Joseph II's accession. The combination of recess and photo also works beautifully well on the stained glass issue of 1979, a subject which lends itself perfectly for a combination of these printing processes, I think. 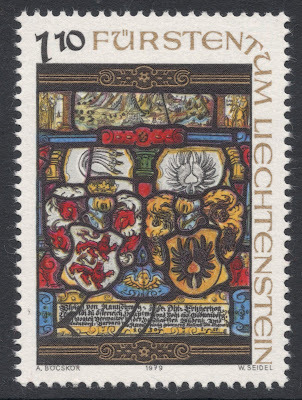 This particular stamp shows the Arms of Ulrich von Ramschwag and Barbara von Hallwil. My final stamp is from the 1980 'Forest through the Seasons' issue which just depicts trees. Again we see a combination of recess and photo here, and you really need to see the stamp itself to appreciate the delicate engraving by Seidel. But just imagine all those tiny branches and twigs and shades in the bark being engraved and you get the idea I suppose! It goes to show that there is so much to enjoy in modern stamps as well. And that it is worth hanging on to your philatelic friends! Could you upload the more 'normal' designs for the Europa sets? I think it would help us get a good sense of the difference. I'll see if I can get enough to turn it into next week's blog post! You can still easily tell which ones are printed in Switzerland and which in Austria. Absolutely, that's probably why I like most of these so much, as they display the sheer quality of Austrian printing. It's one of the fascinating aspects of Liechtenstein philately, this duality of Swiss and Austrian influences.